Barnacle SEO: The Next Hot Trend in SEO? 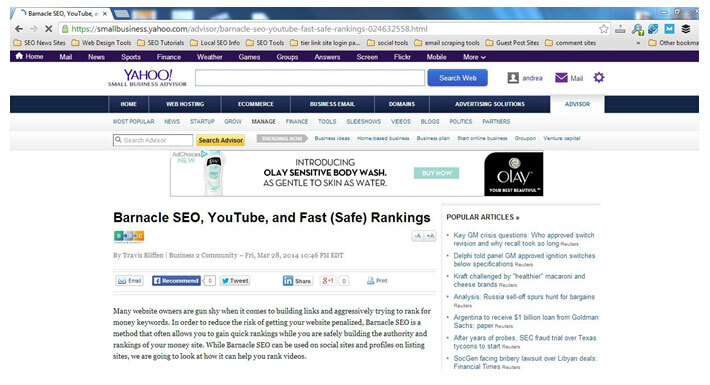 Will Scott was among the first to mention and explain Barnacle SEO back in 2007. Originally deemed as “SEO for the Sam’s Club crowd” this technique is making a strong comeback as penalization risks from Google continuing to grow. If you are looking for a way to get your business in front of customers in your area, Barnacle SEO just may be a wise addition to your online marketing strategies. Barnacle SEO leverages the existing authority of websites in order to expedite the process of ranking your profile or content for a keyword. Do a search for your brand name and you will likely see several profiles appear on the first page. This is one example of Barnacle SEO. More simply put, Barnacle SEO is when you create profiles or content on sites like Facebook, Yellow Pages, or authority niche sites in order to get listed higher in the SERPs. For example, I recently wrote a post on Business2Community about leveraging Barnacle SEO to rank YouTube videos. Since the site is an authority site, my article showed up on page one for “Barnacle SEO” the same day, it then went on to be syndicated by Yahoo. If a non authority site published the exact same piece of content it would take weeks or months to reach the first page. Barnacle SEO is also great for local businesses and local SEO. Since Google has made numerous efforts to crush link building and the ability of SEOs to manipulate search results, a rise in the number of authoritative listing sites in the first page has happened. The good news is that you can hammer these sites with links to get ranked quickly and if that profile drops, just find another one and let it rip. 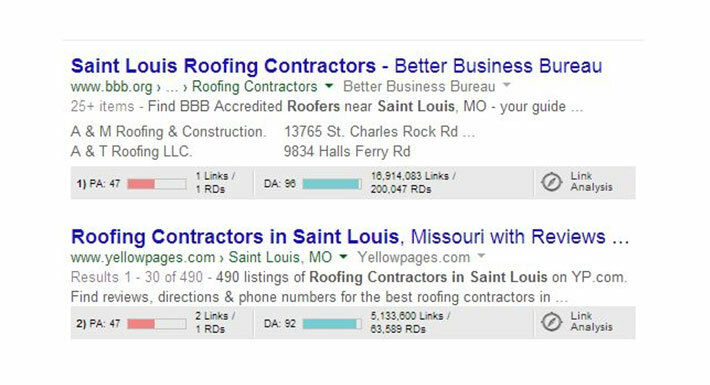 Let’s say that you want to appear for “roofing companies in St. Louis”, you would first see if any sites that allow member profiles or user content are appearing in the first page of the SERPs. In this case the number one and two results are member profile sites as you can see below. In this case, you should create a profile on those sites, optimize it in accordance with their best practices and build links to it. How Do I Know if Barnacle SEO is for Me? To decide if your site is a good target for Barnacle SEO, just type in your keywords and see if you get any sites like Yellow Pages in the first page. If so, simply follow the steps below to leverage Barnacle SEO for your business. If you do not find any profiles try a variation of your search terms or those of your competitors to see if any common sites appear. Find all sites on the first page that allow you to list your business. Sites like Yelp, Yellow Pages, and Manta are common names on the first page. On the social side of things Twitter and Facebook, and Google + are the usual front runners. You may also find high authority niche sites that allow guest posts. Make a list of these sites and create a company profile on each of the pages or submit a keyword targeted guest post. Make sure your profile contains the target keyword in the description, categories, and any other applicable places when creating your page. If reviews are allowed on the site, try to get as many on each site as possible. If you are submitting a guest post, articles over 1,200 words have been shown to be shared more and get more natural links. Once you have setup your profiles and secured your guest posts, you should create a list of the URLs to these pages. You should then begin building links to these pages. If you are building links to a guest post, please only build high quality and relevant links to it. A great way to do this is by linking from one guest post to another. On the other side of things, you can go wild building links to your profiles. Low quality and rapid link building will slide under the radar since most of the major sites have hundreds of thousands of links to them. If you have any automated link building tools lying around, this is a good place to use them. If a more wholesome approach is what you prefer, bookmarking, social sharing, and linking to profiles from guest posts are all good ways to improve your rankings. In a high volume scenario, you are likely to have some profiles removed or deleted, especially if you are building a massive amount of automated links to them. You should check back monthly to ensure that you keep your list of profiles and guest posts up to date to ensure you are not building links to a non-existent page. Not Forgetting Your Own Website Barnacle SEO is great and it can really help drive leads to your business. In addition to ranking profiles and content for your target keywords you should be sure you have a long term growth strategy in mind for your own website. In 2007 Barnacle SEO worked well and in 2014 it is making a strong comeback, but all the time in between your website should be able to generate its own leads. In the end Barnacle SEO is a good way to get instant leads while growing your long term authority with a well optimized website. Having a negative online reputation and a ton of bad reviews from former employees or competitors is enough to make the most loyal customers think twice. 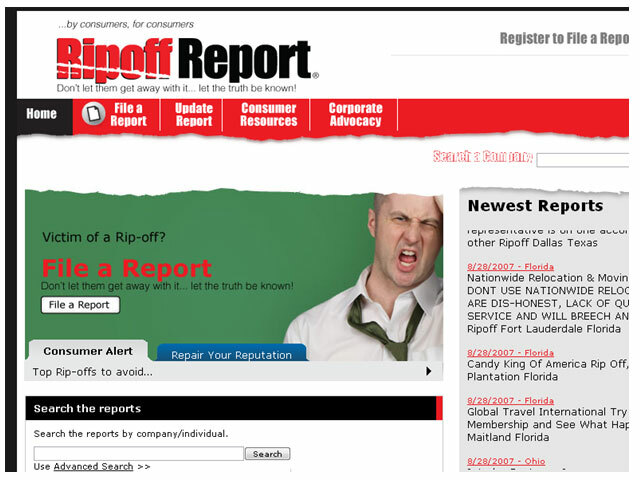 If you find yourself under attack from one of the scandalous sites like Ripoff Report (these dirt bags have been sued numerous times for extortion) that allow anyone to leave a poor review and charge the reviewed company money to dispute or respond to the claims there is still hope. As we discussed above, Barnacle SEO leverages the authority of the host site to expedite rankings and this means you can create a ton of profiles using your brand name and own the first few pages of the Google SERPs, making sure your brand is not wrongfully viewed negatively. As with trying to rank for a keyword, you should just build out your profiles on these sites and any niche profile sites you find along the way. Once you have built the profiles build a few links and you should outrank the bad reviews. If you find yourself with legitimate negative reviews reaching out to the customer and trying to make it right is a much easier approach and the one I recommend. Either way, you cannot deny that Barnacle SEO has been made into a powerful strategy thanks to Googles updates. If you have any questions or comments, I would love to hear them below!